Despite its size, I find New York a remarkably easy city to navigate. Walking and the much maligned MTA subway were are sole modes of transportation this weekend. Keeping to my daily routine, I headed out from our hotel in Downtown Brooklyn for a solo walk early Saturday morning. After a mile or so, I discovered a yarn store (of course!) Alas, Woolyn wouldn’t open for several hours, so I just peeked through the window and snapped a photo. Brooklyn Waterfront Park is a creative, accessible, and — on a mild, sunny, late-winter morning — truly beautiful public asset. On the edge of a renovated pier, I watched the Staten Island Ferry land at Battery Park, the Statue of Liberty and Ellis Island in the distance (New Jersey, too). As always, I sent a silent prayer of thanks to my father, who arrived at Ellis Island in 1939. After a tasty lunch with Hannah in East Williamsburg, we boarded the subway to Manhattan, transferring to the legendary A train for the journey to 190th Street near the northern tip of the island. Hannah did the New York Times’ crossword puzzle on her phone while a fellow passenger practiced guitar. There’s an extensive collection of tapestries, the most famous of which are the likely the Unicorn Tapestries. Given their age (more than 500 years old), travels, and centuries of less-than-ideal environmental conditions, they’re in remarkable condition. I didn’t even try to capture the detail or colors or scale. I hope you can see them yourself one day. Our evening included dinner with cousin Kathy, followed by a performance of “The Band’s Visit.” There really is nothing like live theater. The subway ride back to Brooklyn provided the perfect opportunity to dissect the day, marvel at our great good fortune, and get in a few more rows of the Wee Penny. There’s much I miss about not having any children living at home (at least, most of the time), but being able to easily plan a weekend away isn’t one of them. Yesterday afternoon, Patrick and I hopped in the car and drove a few hours to Stamford, CT where we left the car and boarded a commuter train to New York. Since we’d caught an express train, we arrived a full 90 minutes before we were due to meet Hannah for dinner, a 40-minute walk away. Patrick enjoyed a half dozen (minus one for me) raw oysters and some delicious oyster stew. We had a lengthy, enjoyable chat with a Swiss lawyer on the next stool, who was savoring his two dozen oysters plus a half bottle of wine. By the time we’d finished our brisk 37-block walk to the East Village, we’d worked up an appetite for our second meal! I’m doing a fair bit of air travel this summer, flying down to Washington DC every week for a couple of days with a new client. Even though the good folks at JetBlue provide free in-flight wifi, making it easy to keep up with online work, there’s still a fair bit of “down time” — or as I call it — knitting time. Thanks to multiple flight delays (runway construction and summer storms are the double-whammy of on-time travel), the lovely Woven Sky Throw is progressing nicely. I’m close to the final tier of triangles, which means there’s “just” the border to finish. 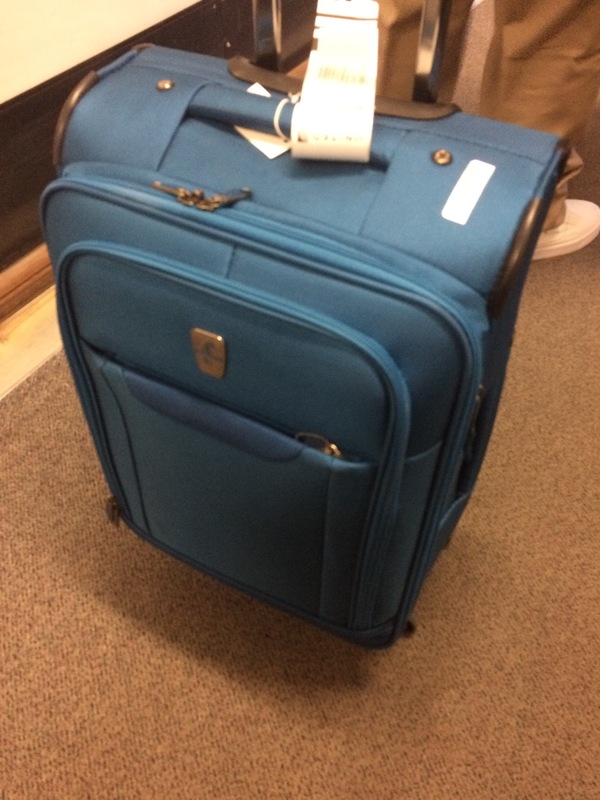 But I’ve come to terms with the fact that it’s gotten too big for schlepping around airports and subway trains. Next step: casting on for the Spring into Summer Romper. While you could hardly say that I lead a jet set life, I’ve had my share of short, turn-around flights over the past few years. Most were work-related as I traveled between Boston and Philadelphia to a client, generally flying down and back in the same day although sometimes with an overnight. Since I finished that piece of work, I’ve not had the occasion to travel much. Hannah’s role in a musical at a community theatre in North Carolina this month provided me and my Mom the chance to take a brief trip for Friday’s opening night performance. My latest sock (Berroco Sox in Red Multi) joined us. 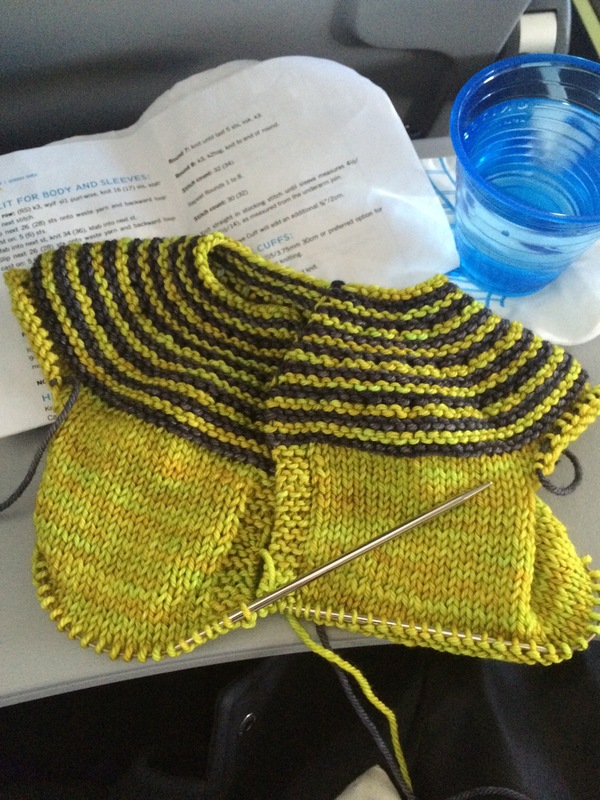 On the flight to Raleigh-Durham, I knit a few inches plus the heel flap. The show, 9 to 5: The Musical, was very well done. You’ll have to take my word for it, especially since photos were prohibited and no reviews are out. And, of course, Hannah was terrific. Yes, I’m biased but I know talent when I see it! When we arrived at the airport Saturday morning, we discovered our flight was delayed two hours because of snow in Boston. One of the great things about knitting is the way it transforms waiting into something enjoyable — or at least distracts the knitter from some of the frustration of waiting. The heel was turned and gusset begun. The time-transforming power of knitting was tested a bit when the pilot announced, as we were second in line to take off, that the Boston airport had gone into a “ground delay” and that we’d be waiting for another hour before we left the ground. And he kindly thanked us for our patience, to which Mom said, “Do we have a choice?” She didn’t have her knitting — just a book, one apparently without time-transforming powers. What really matters is we made it home safe and sound, if somewhat later than expected, AND with a close-to-finished sock as a souvenir (of sorts).